Welcome everyone to the January Tour de Freaks! This month some with be showing off Valentines Day projects while other Freaks will be doing ‘stuff’ with the new Sale-a-bration items! If you are going forward through the hop you have arrived here from Robin Spinner’s blog – About a Girl. Weren’t they fun projects? For my projects I decided to use things from the Sale-a-bration brochure and specifically the Heartfelt Banner. It’s one of those things that really is not my style but thought maybe I could do something with it. Well…I decided to use some of the items to make them into cards and I think they turned out pretty good. For my first one I used Crumb Cake as my base. The doily and two banners are from the pack. The flower is cut from one of the other banners (I used the other piece on my third card). 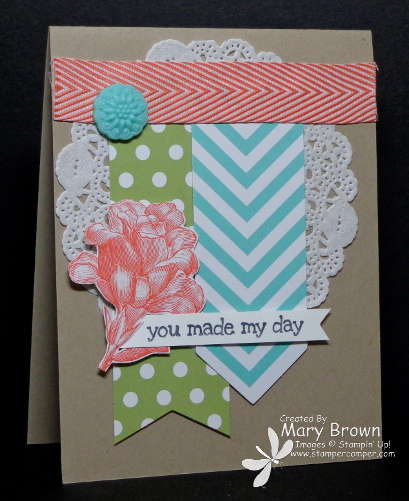 I added a piece of Calypso Coral Chevron Ribbon along the top and added a Coastal Cabana Boutique Detail. I stamped the greeting (Delightful Dozen) on Whisper White using Basic Grey, add to the flower then added both the to card using dimensionals. Now for the second card. This time I chose Coastal Cabana as the card base. I added a piece of the Calypso Coral Chevron ribbon along the top. I layered the dotted banner and the flower one and added some for the Linen Thread (came in the kit) to it. I did use a double strand instead of just a single. These banners are added to the card base using dimensionals. I added a canvas heart (from the kit) then added a Coastal Cabana Boutique Details to the heart. Finally I stamped the greeting using Basic Grey on the card front. 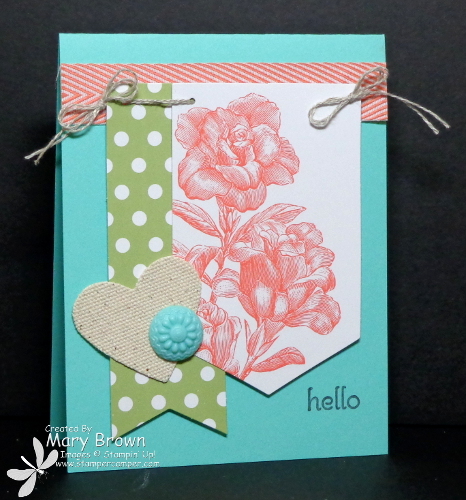 For my third card I used Pear Pizzazz as the card base. I took the canvas banner (from the kit) that has the heart cut out of it already and ran it through the Delightful Dots (SAB) Embossing Folder. I added the left over piece from the first card behind the opening in the heard then added this to the card front using dimensionals. Next I made a bow (just click on my Tutorials tab above and you will find my bow tutorial) using the Candy Dots brad base and Calypso Coral Ribbon. I added it to the Chevron Flag. I stamped the hello twice using Basic Grey on Whisper White, cut into flags and added behind the bow then added this panel to the card front. So those were my cards but what the HECK do you do with the felt balls that come in that kit. THAT was my REAL challenge. First…I cut them in half. 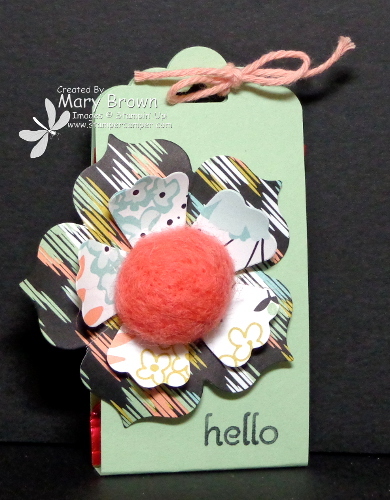 Then I used the Fun Flowers Die and cut out the two smallest flowers using the Sweet Sorbet (SAB) dsp. Now that I had a flower I had to do something with it. I took a 2 x 8 3/8″ piece of Pistachio Pudding. I scored at 4 and 4 3/8. Then I punched both ends using the Scallop Tag Topper Punch. I stamped the greeting using Basic Grey, folded up and added a Ghirdelli Chocolate inside. I tied the top using Crisp Cantaloupe Twine to finish it off. Cool…VERY COOL!!!! So that’s my projects for today! Now it’s time to head over to Justin Krieger’s blog – JK Cards. He has some fun things in store for you. This entry was posted in Sale-a-bration, Tour de Freaks and tagged Delightful Dozen. Bookmark the permalink. Look at you GO, Mary Brown!! Love ALL of these!! You are ALWAYS so ON … thanks for inspiring me ALL THE TIME! I just totally love the way you used to banner kit for so many projects Mary. Hope you are feeling better! These are sweet! Love how you used so many elements! Thanks for sharing your projects using the banner kit in the SAB. I’m not much on banners and I’m always looking for projects using the kits different ways. Love your cards and that tag is fabulous! Thanks for using so much of the Heartfelt Banner kit….it is on my list and fun to see it used!